Holiday Shipping Notice: From November 1st until the end of December orders may take up to 3 business days to ship out. When placing your order, especially if you are choosing expedited shipping, please let us know in the “comments” area of the checkout page what day you need to have the ribbon in your hands. Please specify a date. If we need to give your order extra attention, having that information helps us get you your order on time or alert you to problems. Please note: It is rare that we ship orders the same day unless you have made a prior arrangement (by phone or email) with a member of our staff. If your order is EXTREMELY urgent please call ahead to check that we are able to meet your deadline. We reserve the right to change shipping carriers to get your order there faster. With hundreds of styles and thousands of colors widths etc. 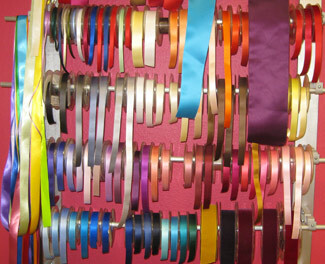 we are not able to keep all of the ribbon on our website in stock all of the time. If you have placed an order for an item that is out of stock we will give you a call right away to let you know what the lead time is for you to receive that ribbon. (You will not be charged for that ribbon until it ships). You can then decide whether to cancel that item or keep the ribbon on backorder. You can always email or call to check stock on particular items beforehand. All of our prices are wholesale. $40.00 minimum order. California: Register an account with us using this link. Then, please fax a resellers permit or e-mail it to "info" "at" "ribbonsunlimitedinc.com". Specify which email name you registered under. We will modify your account so that you are not charged sales tax. Outside California: No sales tax will be charged. California: California sales tax will apply. Large orders (above $1000.00): If you are looking to place an order over $1000.00 please give us a call. Further discounts may apply. We understand how important getting the correct color is. If you are trying to match a particular color, or just want to check the hand of the ribbon, please request a sample. We are happy to send you a cutting of any ribbon at no charge. We can not always send widths requested, only colors. Please include your name and mailing address in your request. If you require a more lasting example for your business, or more samples then are practical to cut, we sell sample cards. Please contact us for pricing. All sales are final at Ribbons Unlimited. However, if there is a problem with your order or if you have received damaged ribbon please contact us immediately and we will get a replacement in the same color/size, or refund your order. We do not take returns based on color issues. We are happy to send samples at no charge. Please contact us for a sample if you are unsure. We strive to make our customers happy. Please contact us if you have any issues. We do not share your personal or financial information, identifying or non-identifying, with anybody.